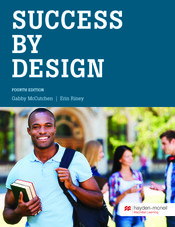 Success by Design is a textbook written specifically for North Carolina community college students. It contains three valuable units: goal discernment, learning strategies, and college culture. The chapters feature strategies that new and returning college students can put into practice immediately, including planning for transfer to a senior institution, managing time effectively, and navigating higher education. The textbook incorporates metacognition techniques to help students plan for effective learning and college success.